On New Year’s Eve 1896, Stephen Crane was finally aboard the Commodore which was beginning its fifth attempt to transport munitions to Cuban insurrectionists fighting to overthrow the military junta. Only 14 months earlier the ship had been impounded, and many U. S. Revenue Cutter ships had been patrolling Florida’s coast to interdict those breaking America’s “neutrality laws,” but Crane’s adventure was finally underway, hidden in the dark hours and the dark waters of the St. Johns River, leaving Jacksonville, Florida, for the open sea. The Commodore drew 9 feet of water which meant it dare not veer from the deep channel, and it was 21 feet wide, fairly narrow, but still a large ship which had been built in 1882, and as local historical re-enactor John F. Mann says in his one-man show about the Commodore, the ship could outrun cutters with its 12 knots, even though it was a 178-ton ship, 122 feet long, and as R. W. Stallman reports in his biography of Stephen Crane, Captain Edward Murphy said, “The Commodore was a fine boat. 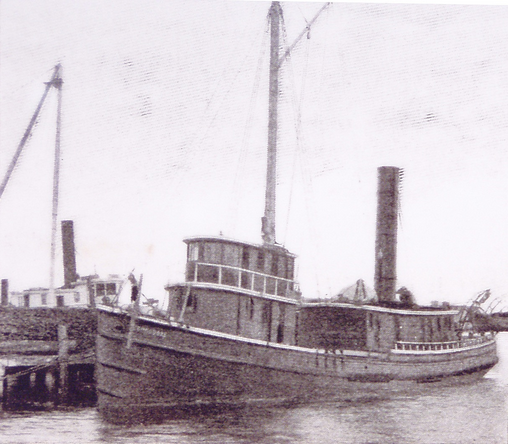 She carried her load like a cork and breasted the waves like a duck.” But the fog was so heavy off Commodore’s Point two miles from Jacksonville that the ship’s bow sliced its way onto a sandbar, and only at daybreak could the revenue cutter Boutwell break it away and tow it toward the Atlantic. After the Commodore was well out to sea, Chief Engineer Redigan was told that water was flooding the engine room and that the pumps had failed so buckets were being used. In desperation as deepening water sloshed through the innards of the ship, the captain ordered oil and even alcohol to be added to the furnace with the coal to fuel the Commodore more speedily the final 18 miles to Mosquito Inlet (called Ponce Inlet today). The winter seas rocked the Commodore side to side so much that the yardarms (the outer tips of the square sail) nearly sank into the waves with each roll of the ship. Twelve Cubans with their baggage piled into the first boat, but another Cuban, Major Baz, dutifully remained aboard ship for another half-hour. Meanwhile the second boat, loaded with all the other Cubans, floated near the Commodore to assist, but the first boat had already separated, attempting to make the 15 miles to shore through the violent seas. Captain Murphy ordered everyone left on ship to enter the last lifeboat, and seven got in; but three men, including Crane, stayed with the captain, so they crowded into a tiny but heavy dinghy of thick wood, an open boat only about 10 feet long, barely large enough for the four men to ride out the storm. Then the boat with seven men returned to the ship to retrieve something, but the ship crashed against the lifeboat, causing it to founder, and all seven men had to scramble back aboard the sinking Commodore and stood there helpless. Over the frigid waves the captain shouted for them to make rafts, but when it came time to jump down onto the rocking rafts, the men stood silently (others said the men were “screaming with fear”). Three men jumped successfully onto the rafts, but the First Mate, without a lifebelt, lifted his arms and intentionally plunged into the sea to his death, leaving three last men alone on the sinking Commodore, unwilling to risk jumping to a raft. Crane later wrote that one “had his arms folded and was leaning against the deckhouse.” The others just stood, resigned to death. The first of the Cubans’ lifeboats beached the next day, Saturday, January 2, near the Mosquito Inlet lighthouse, but the stormy seas and current swept the dinghy along for nearly 30 hours, and sharks threatened at times. The men struggled for their lives through the night, and as the sun rose on Sunday morning, the dinghy neared the area where Daytona’s Main Street pier is today, and the seas continued to threaten the tiny boat as their strength ebbed from lack of food and water, so the Captain whose broken arm was useless for rowing or swimming decided that they must attempt to make it through the high waves to shore, knowing that the dangerous surf and the heavy boat could kill them; and as the boat neared the shore, the waves lifted the boat on end as if into the air and tossed the men before it so that one of them was thrown directly beneath the boat which smashed his head into the sand. Crane, fearing the weight of his $700 of Spanish gold in his moneybelt, stripped it off, never to be found. A young Daytonan, John Kitchell, who operated a little ferry and managed a boatyard on the Halifax River near Main Street happened to be on the beach that day, and Stallman says Captain Murphy said Kitchell “stripped to the skin” (an exposure not even permitted in summer). He was described as being “naked as a tree in winter” when he plunged into the cold January surf and dragged out Montgomery who did not know how to swim, then the captain, and finally, Stephen Crane. Billy Higgins the young oilerman, the best swimmer of them all, lay stretched on the shore–the only one dead. The Captain and Montgomery were taken to Surf Crest cottage, a house at the edge of the dunes (long since torn down), but Stephen Crane spent that Sunday night at the yellow house, Lilian Place, Lawrence Thompson’s home, that still overlooks the Halifax River just to the northeast of the Orange Avenue bridge. Stallman notes that Crane later sent the Thompsons an autographed copy of The Red Badge of Courage, but when Stallman telephoned the Thompsons’ granddaughter, Pat Bennett, she told him she’d never seen it and that the family must have given it away. Higgins was buried in Pinewood Cemetery, but his relatives later had him reburied in Salem, Massachusetts. In January 1897 Crane spent only one night in Daytona. Three and a half years later he was dead. (Click here to read Stephen Crane’s 7 Jan. 1897 New York Press story of the shipwreck. The number of survivors is unclear in reading this, the newspaper account and the short story “The Open Boat”. Is there any clarification to bo found? Also the sabotage theory seems like a valid one due to the political nature of the trip, the carrying of arms and ammo to the rebels, and the broken pumps and the taking on of water. Surely anything to confirm sabotage is lost to history.